Once upon a time, in a land far, far away lived a lovely sewist who spent her days frolicking amongst museum collection items and dreaming of a day when she would have a stunning yet simple skirt for work. She’d often sit at the top of the library and look down at all the well clothed fashionistas scurrying about their business looking stylish (and sometimes be secretly jealous of a particular pair of patent heeled mary-janes). 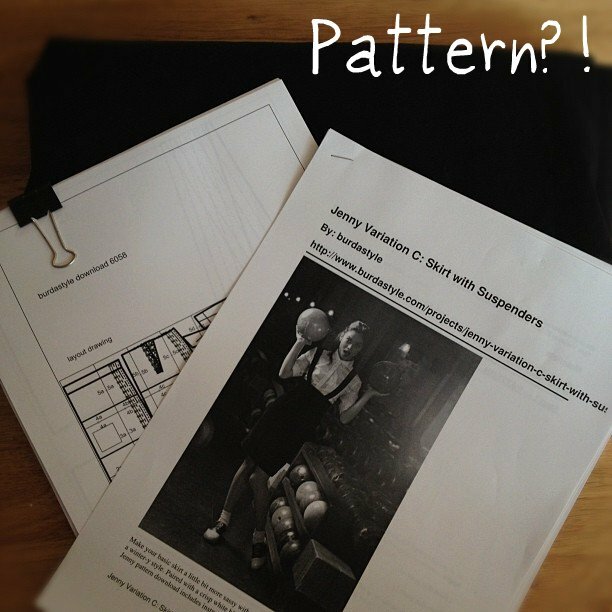 Then one day she found her true love: the Jenny skirt pattern. 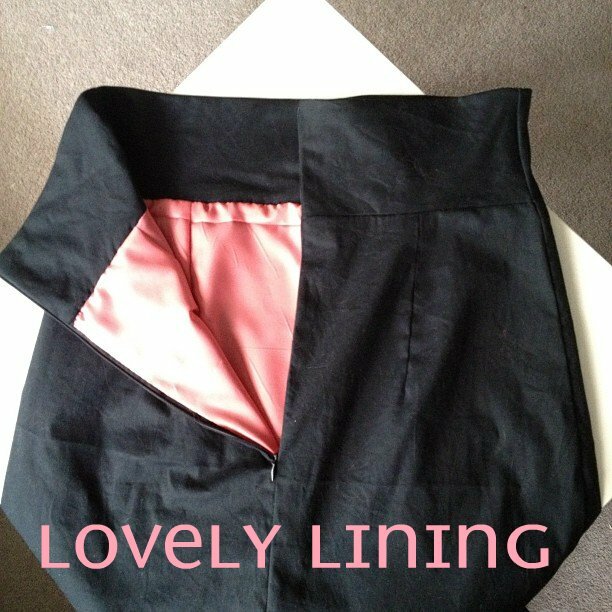 A simple yet sassy pencil skirted number complete with variations. Oh the joy she felt! But the evil muslin fairies had other ideas for her and brought forth the hideous monsters of poor fitting and hot mess-ness. The lovely seamstress refused to be diverted from her path and perservered. Three times the evil muslin fairies tried her but she was super committed and powered by a sherbet flavoured slushees from 7-11. The sweet simple lines of this number made our fair sewist’s heart skip a beat. Heck, bluebirds probably sang at this stage as well. It was magical times for all involved. The high waist band. It’s like a free muffin top slayer. Win! How little fabric it needed. This is a perfect stash buster. The lining and binding. My serger broke so I improvised the finished edges with a crazy green bias binding. I love it! It’s like a secret watermelon underneath. I’d piece things together my own way. I had trouble with the directions after the clarity of Colette Patterns. Interface the waistband. This is something I missed due to the prior point. Try the suspender version. Why? Cause it looks awesome! Overall, I’m rather happy with how this turned out. 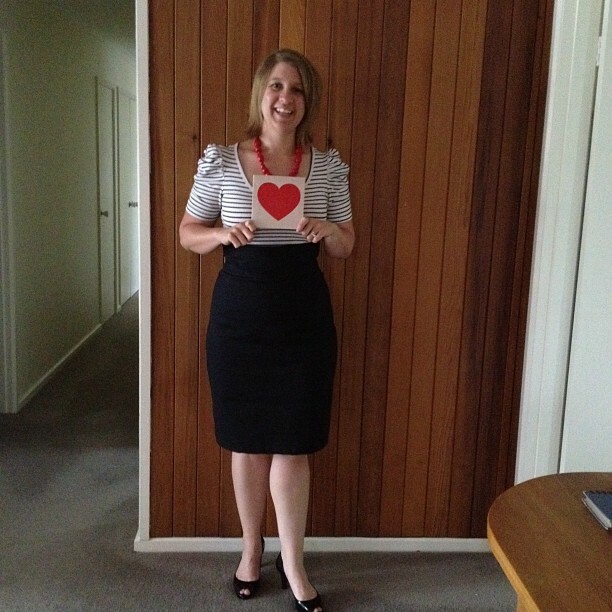 It makes me feel a little like Joan Holloway which can only be a stylistic win in my books! I am slotting this into the win column for my new wardrobe and shall hang it somewhere where it can glower at the travesty that is the Beignet for a while. Love the skirt! It turned out beautifully, and your watermelon-inspired lining is just delicious! Congrats! Very nice! I love the watermelon lining/binding combo. So cute! I love when the insides of garments look as cute as the outsides. It’s like an extra added detail just for yourself. Thank you Kat- I’m addicted to fancy inside parts after my foray into fancy pockets earlier this year! Beautiful! The watermelon lining is genius!